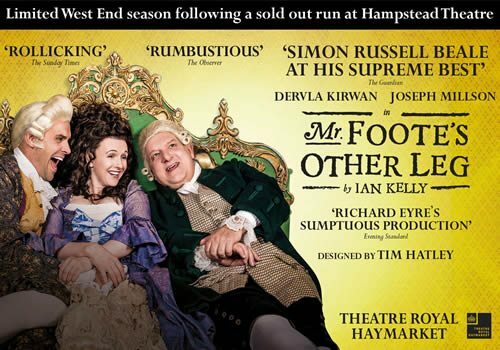 In what seems to be a season of West End transfers, the critically-acclaimed comedy Mr Foote’s Other Leg is set to open at the Theatre Royal Haymarket on November 4th, following a hugely successful run at the Hampstead Theatre, which concludes October 17th. Ian Kelly’s hilarious new play explores the current fascination with the rise and fall of celebrities, through the true story of 18th century Samuel Foote. The production stars BAFTA and Olivier-Award winning actor, Simon Russell Beale in the title role. Mr Foote’s Other Leg is directed by Richard Eyre following his previous success with Ghosts, The Pajama Game and Guys and Dolls. Kelly adapted the play from his biography of Samuel Foote, other biographies including Beau Brummell, Dame Vivienne Westwood and Giacomo Casanova, for which he won the Sunday Times Biography of the Year. Set in Georgian London, Mr Foote’s Other Leg tells the story of the “Oscar Wilde of the 18th century,” Samuel Foote, a satirist, impressionist, comedian and celebrity of the city, who even has the ear of the King. Adored and despised in equal amounts, Foote finds himself at the sharp end of attacks from the press – and a surgeon’s knife. In an age obsessed with fame, his colleagues from stage and science begin to wonder if fame can drive you mad. The production features Design by Tim Hatley and is produced by Michael Codron, Anthony Pye-Jeary and Greg Ripley-Duggan for Hampstead Theatre. Simon Russell Beale stars as Samuel Foote in an unforgettable performance. Recent theatre credits of his include King Lear at the National Theatre, Privates on Parade and the forthcoming Temple at the Donmar Warehouse. He has also appeared in films such as Into the Woods and My Week with Marilyn. Other cast members include Dervla Kirwan as Peg Woffington, Joseph Millson as David Garrick, Micah Balfour as Frank Barber, Jenny Galloway as Mrs Garner, Ian Kelly as Prince George, Forbes Masson as John Hunter, Colin Stinton as Benjamin Franklin and Charles Macklin, Sophie Bleasdale as Miss Chudleigh and Joshua Elliot as Hallam. Interestingly, Samuel Foote was the theatre manager of the Theatre Royal Haymarket in 1746, regularly entertaining audiences with his comic routines. Foote also helped secure the royal patent for the Haymarket, which continues to this day. Mr Foote’s Other Leg will open November 4th and will run for a limited twelve weeks until January 23rd 2016. An engaging comedy, children may enjoy the production if accompanied by an adult.